I spent the night with Alice Cooper. 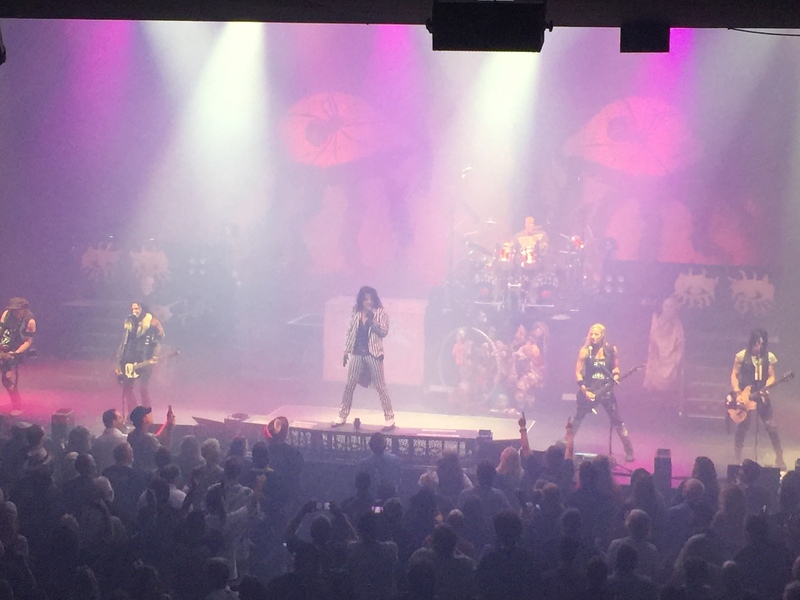 August 21, 2016, Alice Cooper came to Austin, Texas to play the ACL Live Moody Theater as a part of his “Spend the Night with Alice Cooper 2016” tour. It’s 2+ hours of Alice and only Alice, and what a night it was. It was luck that I got to see the show. Karl had an extra ticket, asked me if I wanted it, and of course I took it. After having seen Alice back with Mötley Crüe 2 years ago, I was always wanting to see a full headlining set from him, so here was my chance. Also very cool? A couple of Karl’s friends also attended. Their first concert/date was seeing Alice, back in 1973. So this was a sort of cool “anniversary” sort of celebration for them, and it was an absolute pleasure to meet them and share in this evening with them. On the way in, Karl was listening to the local rock radio station, KLBJ-FM. They were having a pre-show at the 310 club, which is a club/bar under the Moody Theater. The pre-show was free, and if you attended and had a ticket to the Alice show, you could enter a drawing to win a ticket upgrade (to a suite) or a chance to meet Alice. So after an early dinner we headed to the pre-show and put our names in the drawing. The pre-show itself was a local band called Bang. It actually was local band Vallejo dressed up with wigs and playing 80’s metal cover tunes. I noticed a bunch of incorrect lyrics were being sung, but as they played on things got better. For sure, the guy can sing (and he really should have sung an L.A. Guns song, like “I Wanna Be Your Man” because his voice would have been perfect for it). Seems like this was just a one-off fun thing they did, and overall it was enjoyable. Our tickets were on the floor, towards stage right, and wouldn’t have been bad seats. But the suite was up on the mezzanine level, and ultimately provided a better view of the show. The suite itself? Meh. I mean, while we waited for the show to start, the couches were nice and it was cool to chill there, but you couldn’t lounge and watch the show. So we stood, which was fine, and had a great view of the show. Either way, it was cool to have won, for just the cost of attending the pre-show. Thank you KLBJ! Karl said it best: it wasn’t a concert, it was a show; almost like a Broadway show. Whereas in a concert you might play a few songs, then stop and rap with the audience, then intro the next song and so on – that is, it’s just playing songs; this was a show. This was one song after the next, almost no breaks, no “rapping”, just putting on a presentation. The band was tight. Appears to be the same band I saw him with two years ago. They knew their parts. Highly choreographed, well-rehearsed, and just well presented. Don’t take that as a bad thing: Alice is putting on a show, with props, acting, pyro, and a host of other things and you just can’t pull that off with a winging-it-improve-type set. Plus the band members have to be in the right places so that proper emphasis is given to what needs to be viewed, and they don’t get hurt! There’s a lot going on on stage. Many good songs played, including pulling out some more obscure tracks as well as the expected hits. Of course, good prop stuff happened, like “Feed My Frankenstein”, and “Ballad of Dwight Fry” into “I Love the Dead” – guillotine and all. Alice is also playing off the election year with a lot of “Alice Cooper for President” stuff, and even bringing out a couple of his actors in Trump and Hillary get-ups (alas, no guillotine for either of them). Quite well done, and amusing all the way around. He’s also been doing a set of covers, Hollywood Vampires stuff. “Pinball Wizard”, “Suffragette City”, and “Ace of Spades” – which seemed to feature more of his bassist, which of course was quite appropriate. Just nailed this covers. Alice might be 68 years old, but you would never know it. High energy, non-stop rock and roll show for 2+ hours. Just tight tight tight, and knocked your socks off. Would see again, and again, and again, and again. Oh, if ever a reason to HATE on Hsoi was seen…. AC is a long time fav. Never had the pleasure to see one of his “shows”. You gotta find a way to make a show. Just amazing. I hear that. It’s why I’ve been working to make a stronger effort at getting to shows and other things. I’m still not getting to all the things I want to get to, but I’m trying.